I almost feel unethical posting this as a “recipe.” It’s so simple– a boil, a sprinkle, and done. It came about mostly in an effort to clean out my fridge and spice cupboard. And yet, the result of said kitchen tidying had the added bonus of this stunning salad. (Is it a salad all on it’s own? Or would one need to add lettuce for that? I never know.) The delicate dill rounds off the somewhat bawdy beets. The resulting dish encompasses the best aspects of farm-to-plate eating– earthy richness and heavenly crispness. Because beets are the main ingredient here, make sure you use the freshest beets you can find. Old ones that have been lolling around shelves for a few weeks tend to be woody at best and bitter at worst. 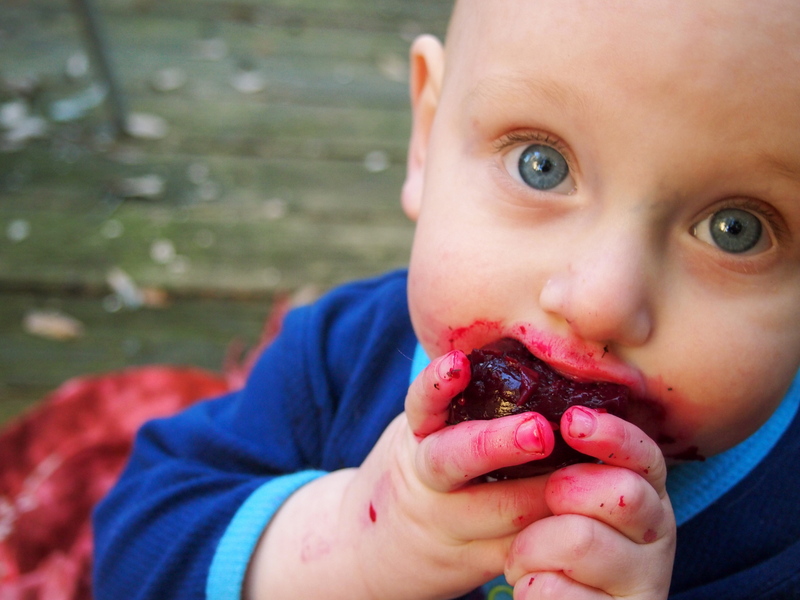 A good beet should be as sweet and firm as a good kiss. To assess the freshness of your beets, squeeze them. They should not be in any way squishy. You can also make sure the greens are crisp and lively, not wilted and listless. Like most vegetables, your best bet is to buy your beets from the person who grew them. A bonus of finding a local source of beets is that you’re more likely to encounter different varieties. 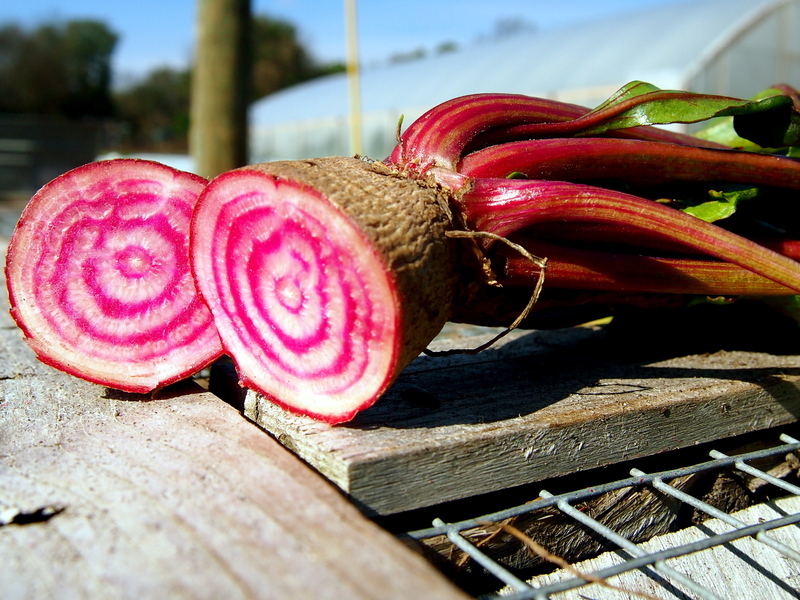 I used the two kinds that City Roots is growing: Bull’s Blood, a deeply red beet, and Chioggia, an heirloom beet with beautiful fuchsia and white rings. (Tragically, these fade when cooked.) While I can’t say they taste much different, they do vary dramatically in color and make a very pretty salad when tossed together. And, out of neighborly concern, I do feel the need to assure you that, the morning after eating this, don’t worry. You’re not dying. You know how people used to dye things with beet juice? Yeah, that’s what happened to your insides. All’s well. Rinse off any dirt from your beets, then cut the tops and tails off. 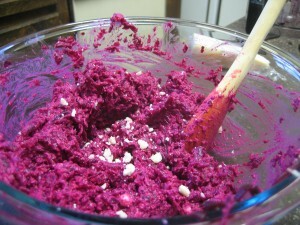 If you are using small beets, you may leave them whole. If you are using large beets, cut them into quarters. Put them in a small pot and cover with water. Bring to a boil and simmer for 10 minutes. Let cool. Dump them in a colander and rub off their skins under warm water. 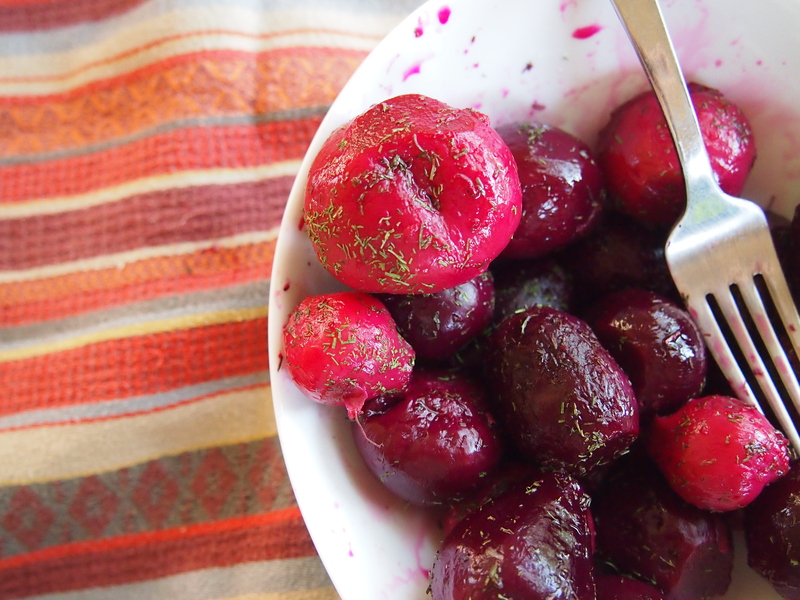 Place the beets in a bowl, toss with olive oil and stir in dill and salt. Serve cold or at room temperature; alone or on a bed of greens. 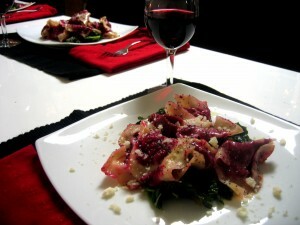 The magenta of these ravioli caught my eye in a winter kitchen-scape littered with potato peels. Having only met beets last Tuesday, I’m still growing accustomed to their extroverted color. It was in the middle of preparing this recipe that I realized the full meaning of “beet red.” Why is it that the good metaphors always get overcooked in pop culture? The recipe is very easy to follow. One person can easily do all of the prep. A large Italian family is required for the assembly and cooking of the ravioli. Also, there is not much direction in how to tell when the ravioli are done. It’s not like spaghetti that you can throw against the wall to determine if it’s al dente. My first batch, which I cooked the full two minutes, was flabby and fell apart, making my water go beet red. After some trial and error (meaning I googled “ravioli cooking time”) I discovered that ravioli are done when they rise to the surface. The only other problem I encountered was how to keep the cooked ravioli warm while finishing the rest. If left them in the butter, they got greasy. But leaving them in a bowl yielded a sticky mess – even though I drizzled in some olive oil. But even the sticky mess couldn’t smear the beauty of the final presentation. I served the ravioli on a bed of wilted garlic-y kale and crumbled Pecorino. 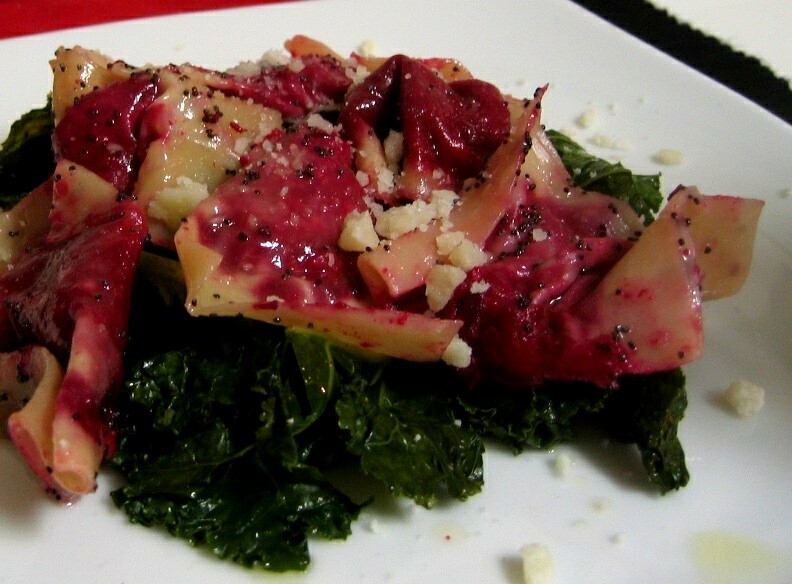 The bitterness of the kale along with the tang of the cheese cut the sweetness of the beets.